Maple isn't just for pancakes anymore! We may think of maple and brown sugar as a breakfast flavor combination, but these two ingredients combine nicely in a delicious cupcake. Richly flavored with vanilla extract and brown sugar, these sweet cupcakes are soft and moist thanks to the addition of buttermilk. 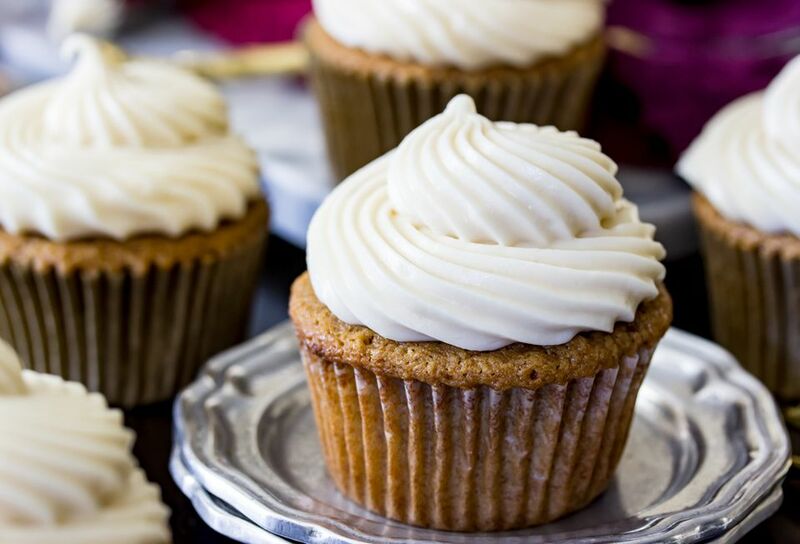 They are topped off with a maple frosting made with cream cheese for a subtle tang that will keep your cupcakes from being too sweet. Preheat oven to 350 F and line a 12-count muffin tin with paper liners. Set aside. Combine butter and brown sugar in the bowl of a stand mixer (or in a large bowl using an electric hand mixer) and beat on medium speed until ingredients are well combined and light and fluffy. Add the egg, beat well. Stir in vanilla extract. In a separate, medium-sized bowl, whisk together flour, baking soda, baking powder, and salt. To the butter-sugar mixture, gradually fold in about 1/4 of the flour mixture by hand using a spatula, until just combined. Add about 1/4 cup of the buttermilk and use spatula to fold in until just combined. Continue to alternate adding flour and buttermilk—ending with the flour mixture—until the ingredients are completely combined. Take care to not overmix the batter but do make sure the ingredients are well combined and the batter is smooth. Fill cupcake liners 2/3 of the way with batter. Bake for 18 to 20 minutes, or until cupcake tops spring back when gently touched and a toothpick inserted in the center comes out clean or with few moist crumbs. Allow cupcakes to cool completely in pans before frosting. Using an electric mixer, beat together softened cream cheese and butter until well-combined. Add brown sugar and beat until well incorporated. Gradually add powdered sugar until completely combined. Add maple syrup, vanilla extract, and salt, and stir until ingredients are thoroughly combined, pausing to scrape down the sides and bottom of the bowl with a spatula. Pipe or spread frosting over cooled cupcakes. If you don't have any buttermilk on hand, there are a few ingredients you can use to substitute. Plain yogurt has similar properties and flavor to buttermilk—you may just want to give it a good stir before adding to try to thin the consistency. You can also use a combination of milk and vinegar or lemon juice or milk along with some cream of tartar. As the ingredient list states, the butter, egg, buttermilk, and cream cheese should be at room temperature. It is important you don't skip this step; the ingredients mix more uniformly when they are all the same temperature, and the butter will blend in better instead of remaining in small chunks. Of course, the frosting can't come together if the cream cheese and butter are stiff.